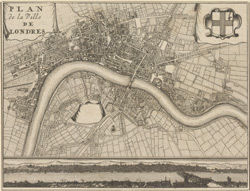 This small map of London appeared in a book entitled "Memoires et Observations faites par un Voyageur en Angleterre", published in France by Henry Van Bulderen in 1698. The map is a much-reduced derivative of Joannes de Ram's plan of 1690. This edition features title at top left, city arms at top right and a panorama of London, based on Matthaeus Merian’s view of the city, in a panel below the plan.